A major problem with America’s healthcare system, both before and after Obamacare, is the fact that consumers very rarely spend their own money when obtaining healthcare. Known as third-party payer, this problem exists in part because government directly finances almost 50 percent of healthcare expenditures. But even a majority of supposedly private healthcare spending is financed by employer-provided policies that are heavily distorted by a preference in the tax code that encourages insurance payments even for routine expenses. According to government data, only 12 percent of healthcare costs are financed directly by consumers. And since consumers almost always are buying healthcare with somebody else’s money, it should come as no surprise that this system results in rising costs and inefficiency. This is why repealing Obamacare is just the first step that is needed if policymakers genuinely want to restore a free market healthcare system (all of which is explained in this 4-minute video). Unfortunately, many people think that market forces don’t work in the healthcare system and that costs will always rise faster than prices for other goods and services. There are a few examples showing that this is not true, and proponents of liberalization usually cite cosmetic surgery and laser-eye surgery as examples of treatments that generally are financed by out-of-pocket payments. Not surprisingly, prices for these treatments have been quite stable – particularly when increases in quality are added to the equation. I just ran across another example, and this one could be important since it may resonate with those who normally are very suspicious of free markets. 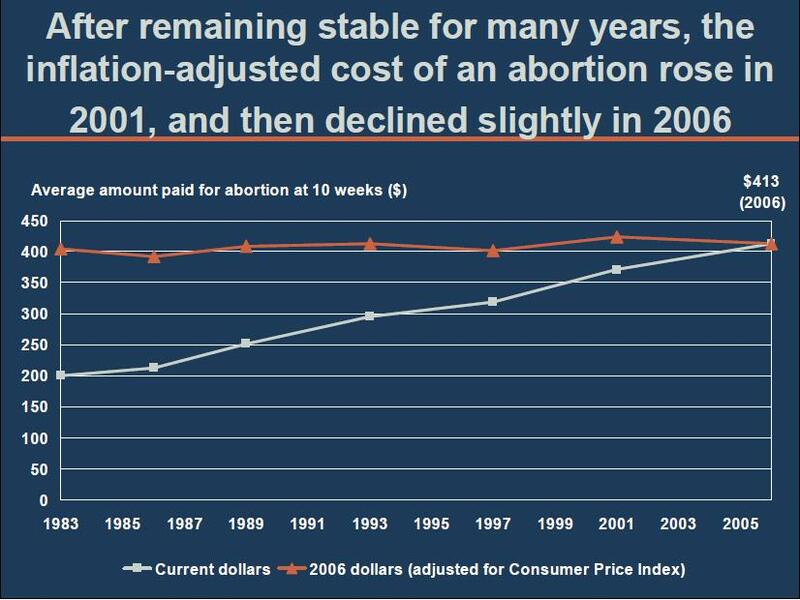 As the chart from the Alan Guttmacher Institute shows, the price of an abortion has been remarkably stable over the past 20-plus years. Let’s connect the dots to make everything clear. Abortions generally are financed by out-of-pocket payments. People therefore have an incentive to shop carefully and get good value since they are spending their own money. And because market forces are allowed, the cost of abortions is stable. The logical conclusion to draw from this, of course, is that allowing market forces for other medical services will generate the same positive results in terms of cost and efficiency. None of this analysis, by the way, implies that abortion is good or bad, or that it should be legal or illegal. The only lesson to be learned is that market forces control costs and promote efficiency and that more government spending and intervention exacerbate the third-party payer crisis. The same is true for elective procedures, whether it’s lasik surgery or cosmetic surgery. Doctors are no different than other business people, who are often forced through free markets to reduce prices or go out of business. Very good article. Insightful and entertaining as always! Keep up the good work! When one considers that there is often a general lack of competition among abortion providers due to fewer practitioners than demand would warrant (for a variety of reasons), then that the price has stayed level in inflationary dollars implies that in more competitive areas in medicine allowing greater market forces would reduce prices after inflation.